Elegant bookends with three books. 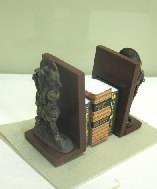 (Books are not attached so bookends can be used with your own books if you wish.) Hand crafted in the U.S.